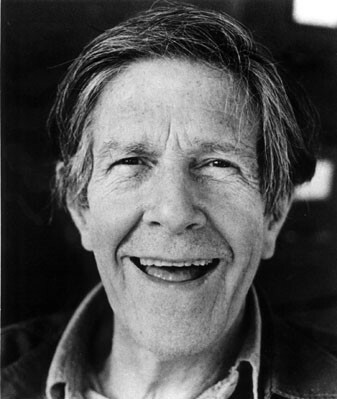 In the latest Three Beats, I wrote about the upcoming A John Cage Festival organized and curated by composer Nomi Epstein (who also leads the terrific experimental-music collective Aperiodic) to celebrate the centennial of Cage's birth. I interviewed her for the piece, but I thought her answers were interesting and illuminating enough to stand on their own—so below is the complete conversation. After the Three Beats piece was published, Epstein let me know that I'd used one quote out of context: when she says, "I think there is a misconception that a lot of this work is 'easy' to perform based on a glance at the score, but I believe it requires a real commitment," she was referring to the Wandelweiser Group works that Aperiodic regularly tackles, not to Cage's music. I apologize for the mistake. The interview begins after the jump. Obviously there will be loads of Cage festivals, concerts, and celebrations this year. What made you want to get in on the act? I've always been aware of the fact that I've been influenced by John Cage (his writings, music, philosophy, aesthetics), but it's only in the last few years that I've come to truly understand the depth to which this is true, and that it is true for so many of us today who are involved with new music. This realization became apparent when I was a participant at Darmstadt in 2010, a European music festival and institute with a long and somewhat controversial (though only within the music community) history, and was shocked that nearly every lecture given by the list of European notables mentioned John Cage in some facet. It was an enlightening experience for me to consider that Cage's influence was so strong and so alive in European circles of "academia," when in America his works are often presented briefly on the day in class that graphic scores and 4'33" are discussed. I began to think about the basic concepts that Cage introduced and that they are so rooted in much of late-20th-/early-21st-century artistic thought, regardless of how this may or may not have been presented to me in my schooling (in America). As the centennial approached, I was thinking about this strong influence and was also getting ready for a lecture that I gave at the Black Mountain College John Cage conference, and I decided that I wanted to offer those new-music specialists in Chicago the opportunity to reflect upon the direct impact that Cage has had on us in the form of performance. I think of it as a group contribution toward celebrating Cage and recognizing his current presence in our lives as performers, composers, and curators. All of the performers on the festival specialize in playing music of the last 50 years, and so perhaps in this way they are also connected to the Cage influence. What do you think distinguishes your festival from other Cage tributes that you know about? I think what might distinguish my festival from others is that although it is quite a large festival, five concerts over three days in four different venues—with performers coming from Bowling Green, Ohio (Quince Contemporary Vocal Ensemble), Carbondale, Illinois, and Kalamazoo, Michigan, plus members of Allos, Maverick, the CSO, Fulcrum Point, Dal Niente, Aperiodic, the Chicago Scratch Orchesta, notable sound artists, video artists, and choreographers—it is a very grassroots initiative, where everyone involved has been incredibly generous and driven to make the events successful. Was there any particular facet or period of his work that you wanted to focus on? Early on, I knew that I wanted to present some of the number pieces, a group of works written in the last six years of his life which bring his music quite close to the aesthetic of Morton Feldman (one of my great influences). The notation for these works allows a wonderful indeterminacy where each player's events occur for any chosen duration within a window or "bracket" of time. Cage wrote over 50 of these works, and they were each titled by the number of performers involved in the piece and a superscript to denote a One from a One1, et cetera. The simultaneity of events between the players and the moments of nonplaying between events change from performance to performance, creating a unique, personalized rendition which captures that specific moment in time, by those particular players, in that space. The festival will present Four for string quartet, a truly beautiful work 30 minutes in duration written for the Arditti Quartet in 1989, and a piece which was performed at the first Aperiodic concert by two of the same players who will perform on April 14 (Billie Howard and Nora Barton). On the final concert of the festival three percussion groups, the Chance Operations Collective of Kalamazoo, the Percussion Art Ensemble, and the Improvisation Unit, who will travel from Kalamazoo, Michigan, and Carbondale, Illinois, to perform, will present Three2 (1991), and finally the last piece on this program/festival—Four6, also 30 minutes in duration (written in 1992, the last year of Cage's life). Judging from your work with Aperiodic, you clearly have an affinity for Cage's experimental side—that part of his legacy and his philosophy isn't always so apparent in Chicago, even among the most adventurous ensembles. Can you discuss how important that element is for you? I am especially drawn to the indeterminacy in Cage's works, both in notation and in performance. This has led me into a repertoire, the Wandelwesier Group, which captures and develops a number of the concepts that Cage introduced throughout his life's work, namely the concepts presented in 4'33" (Focused Listening, Subtlety of Sound, Creation of Sonic Landscape, Transformative Listening Experience—all terms I developed for my essay "After 4'33": The Music of the Wandelweiser and Beyond"), the use of a text score, or one that involves indeterminacy. What I am most interested in doing is providing a very careful consideration of the notation, of the possibilities of this repertoire in rehearsal/performance and programming. I think there is a misconception that a lot of this work is "easy" to perform based on a glance at the score, but I believe it requires a real commitment, which is very time consuming and rewarding. David Behrman, in a residency I was at, referred to this type of notation as "deceptively simple scores," ones that have a seemingly simplistic look to them but that can offer much more thought-provoking concepts in rehearsing, performing, and listening. Because I really enjoy this work, I think it's important to give it a space, and I feel the repertoire presented in Aperiodic wouldn't fit in the context of a typical new-music concert. So even ensembles that are interested in doing this repertoire, I personally think would find it difficult to program within works so different from it, and so an entire concert of it would be necessary. The kind of mental space, of musical space and of contemplation, that may be involved may not be possible on a program with works that don't complement it. This post-Cagean notated music that I program is certainly an aesthetic which lies between others currently being focused on in Chicago, but it is certainly not improvisation. Indeterminacy of varying degrees has been a staple in my own compositions—but also a sense of equality between the members of the ensemble, a sense of all members working toward a common goal, that one instrument does not necessarily carry the weight of the piece, but rather each member's small parts amass to form the sound, is something I take directly from Cage. Finally, it would be terrific if you could point out a few of the performances you're most excited about or think are most unique. Although I am truly looking forward to hearing all of the performances on the festival, there are a few highlights for me. One highlight would be Four for string quartet, as this is one of my favorite Cage works, and I found it such an important listening experience when it was played at the Aperiodic concert last season. Another work I am really looking forward to is Concert for Piano and Orchestra. This piece is best known and perhaps taught to music students for the extensive graphic notational systems that Cage developed in the piano part, where the pianist must learn how to decipher over 80 types of notation in the 63 pages. It was written for David Tudor, who has created some traditionally notated transcriptions of the part. The score is written entirely in separate parts (no full score exists), and it can be presented with any number of performers, going from solo up to its full ensemble. The festival will present it with William Jason Raynovich of Maverick Ensemble, a cellist/composer whose main focus of research in his doctoral work was on Cage and his notation; James Falzone of Allos, who just performed this same piece with Christian Wolff, Takehisa Kosugi, and David Behrman on the Merce Cunningham Legacy Tour at Harris Theater in November, 2011; and Michael Lewanski of Dal Niente performing the optional conductor solo. Lastly, there will be a monumental performance, or a performance of a monumental piece, Cage's Variations V. Variations V (1965), a large multimedia work, was originally a collaborative performance between John Cage, Merce Cunningham, and such notables as Robert Moog, David Tudor, James Tenney, Nam June Paik, Stan Vanderbeek, Billy Klüver, Max Mathews, and Carolyn Brown. This 45-minute piece is presented by a team of Chicago sound artists and musicians, with Cunningham dancer Enid Smith. The Chicago team, led by sound artist/composer/guitarist/improviser Julia Miller, also includes James Connolly, Kyle Evans, Eric Leonardson, Alex Inglizian, Christopher Preissing, Gregory O'Drobinak, Tatsu Aoki, Enid Smith, Melissa Schleicher-Sanchez, and Jaime Juravic. Amplifiers and horn speakers generously donated by Ian Schneller/Specimen. The piece involves various light-resistant photocells being triggered by the movement of dancers. Photocells may be linked to sine waves/harmonics of 60 hertz which are then sent to electromagnetics in televisions and computer monitors, square-wave frequencies which create vertical bars in the VGA computer monitors, as well as video. Audio signals generated from other audio elements of the sound environment (synthesizers, tape recordings, contact microphones placed on various objects) as well as real-time video of the dancers will affect both audio and video. For more information about the performance, visit juliamiller.org. Because of the extensive preparations, rehearsal time, the large team involved, and the sheer magnitude of the piece, there will be two performances of Variations V on April 14: 7 PM and 9 PM. The influential experimental composer’s largest archive lives in a library at Northwestern—and it goes a lot deeper than its famous Beatles lyric sheets. Plus: Bow & Hammer violinist Kathryn Satoh on a classical piano duo that plays Taylor Swift, Reader music editor Philip Montoro on a record so evil it’s almost funny, and more. The composer whose curiosity about acoustic phenomena transformed contemporary classical music comes to Chicago for a historic three-day career retrospective. Despite his pioneering work with electronics and indeterminacy, he’s far more obscure than his friend John Cage—in part because he considered his music a living practice rather than something to be documented.